Begin your European river cruise with incomparable festive cheer in the heart of Germany’s Christmas markets. Warm your heart and memories by embarking on your Avalon Suite Ship® in Mainz, then on to a Bavarian Main river village for Christmas scenes and specialty sweets. Your Christmas cruise continues to Würzburg with classic sightseeing of the "Pearl of the Romantic Road" amid the glow of local Christmas markets and the city’s dazzling architecture. Sail for a guided sightseeing tour of the glowing Christkindlesmarkt of Bamberg-complete with dozens of nativity scenes of every size. Your cruise through the Christmas markets of Germany continues into Nuremberg with its festive atmosphere with Bavarian favorites such as bratwurst, gingerbread, and mulled wine will warm your spirit with traditional cheer. Sail from Nuremberg to Regensburg, and next to Passau, with its narrow streets and baroque St. Stephen’s Cathedral. In Melk, you will visit Austria’s majestic Benedictine Abbey and then sail through the picturesque Wachau Valley to Vienna. 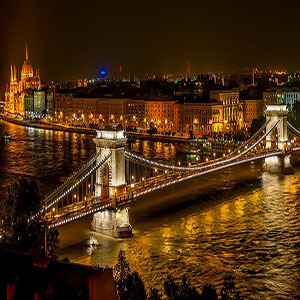 Your European river cruise vacation ends in Budapest, the capital of Hungary. With Christmas memories of Germany, and the Danube’s legendary beauty, this Christmas river cruise will be cherished for years to come.